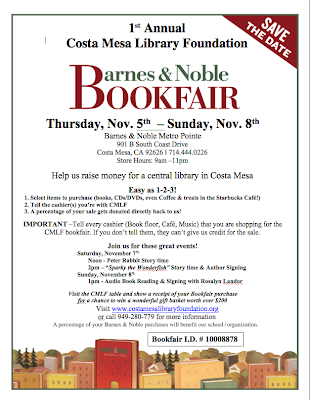 My friends at the Costa Mesa Library Foundation recently announced the 1st annual Barnes & Noble Bookfair! The event will be held at Barnes & Noble Metro Point from Thursday, November 5th through Sunday, November 8th. Store hours are from 9a.m.-11.p.m. I've attached a flier with all the details, but basically the Costa Mesa Library Foundation gets a percentage of any purchases of books, CD/DVDs and even snacks and coffee at the Starbucks Cafe'. 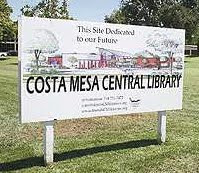 All you have to do is tell the cashier that you are with the Costa Mesa Library Foundation when paying your tab. Unfortunately, purchases of gift cards, Barnes & Noble memberships, text books and magazine subscriptions are not included in Bookfair totals. 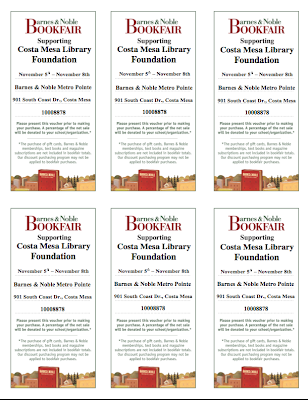 I've also attached a sheet of vouchers with the event number, Bookfair I.D. #10008878, on them, although the presentation of a voucher is not necessary for the CMLF to receive credit. I'm also reminded that purchases can be made at ANY Barnes & Noble location during the established times for this very worthwhile event. Thank you for the publicity, Geoff. We are looking forward to a successful event. My pleasure... we'll mention it again later in the week. Good luck with it.